(16/P118) TRENTON – The Christie Administration today honored a broad selection of environmental groups, scientists, companies, educators and students from across New Jersey for their leadership to protect and improve the environment. Honorees recognized at the 17th Annual Governor’s Environmental Excellence Awards ceremony at the New Jersey State Museum in Trenton included a Stockton University professor who helped develop what became the first comprehensive forest management plan for the ecologically sensitive Pinelands region; a Jersey City afterschool program that is innovating state-of-the-art solutions to common environmental issues; a Newark business that has taken indoor farming to new heights; and a Central New Jersey organization that helps certify others in sustainable land stewardship practices. Award winners also included a South Jersey school district whose development of an energy plan is expected to save its taxpayers more than $5 million over 15 years; a collaborative that leverages expertise from multiple sectors to study how to improve water infrastructure statewide; and a pharmaceutical giant that has re-engineered its food waste collection program into a streamlined composting success story. 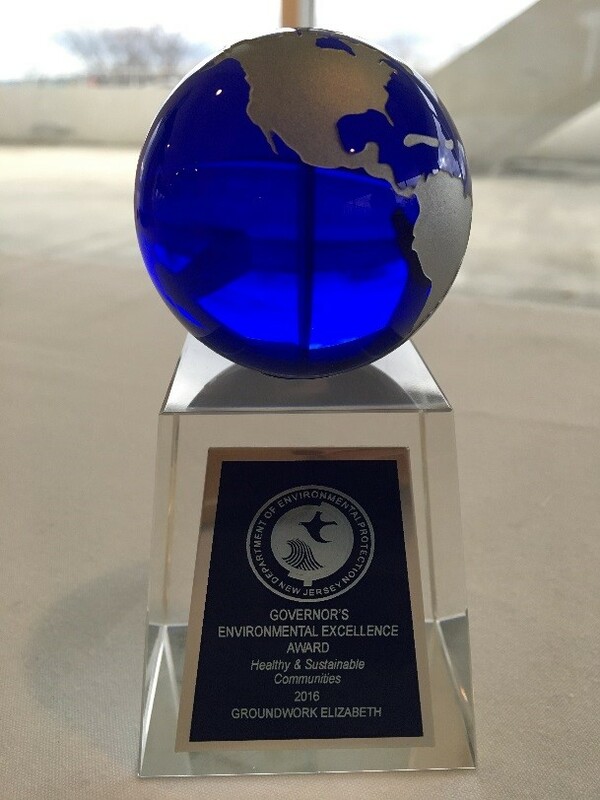 The Governor’s Environmental Excellence Awards (GEEA) are the state’s premier environmental awards program for recognizing outstanding environmental performance, programs and projects in the state. Including today’s event, the program has recognized 160 winners since 2000. The awards program is sponsored by the DEP, New Jersey Environmental Infrastructure Trust and the New Jersey Corporation for Advanced Technology, in partnership with the New Jersey State League of Municipalities. Delran Township Public Schools in January 2015 began exploring the development and implementation of an Energy Savings Improvement Plan as a way to reduce energy use, increase sustainability and save money. The Burlington County district chose an Energy Services Company approximately a year ago, developed a district-wide plan and began construction this past July. The project, which began construction in July 2016, will result in better interior and exterior lighting systems, improve temperature control by upgrading building management systems, add air conditioning at some locations, and install new roofs at two schools. Work is expected to be completed in August 2017. The results are anticipated to reduce energy costs by 32 percent, cut emissions in half, produce 80 percent of the district’s electric needs through on-site solar, and save taxpayers $5.6 million over the next 15 years that can be used to fund other educational needs throughout the district. The River-Friendly Programs of the Raritan Basin works one-on-one with residents, businesses, schools and golf courses to improve land stewardship practices and complete several challenges in order to be certified River-Friendly. The program, a joint initiative of the Stony Brook-Millstone Watershed Association, Raritan Headwaters Association and New Jersey Water Supply Authority, aims to help program participants be more mindful of their impact on water and land by following four key principles that address water resource challenges in the 1,100-square-mile Raritan Basin across Central New Jersey: reduce pollution, conserve water, restore habitat for wildlife and educate the public about becoming better environmental stewards. To date, the program has worked with hundreds of residents to become River-Friendly, and is currently working with 13 schools, 16 businesses and seven golf courses to achieve the designation. This one-year-old collaborative among representatives from the public and private sectors, public utilities, the environmental community and regulatory agencies is the first of its kind in the nation to consider possible solutions to the complex and costly problems associated with aging and inefficient water infrastructure statewide. One of the biggest water challenges in New Jersey – and a key issue for the collaborative – is combined sewer overflow (CSO) systems, which discharge raw sewage into waterways after significant weather events, and sometimes lead to sewage backups in homes, streets and parks. The collaborative targets cost-efficient solutions that would result in clean water and waterways, flood and climate resiliency, and economic growth that create both local jobs as well as healthier and safer neighborhoods. In its short tenure, the collaborative has received support from the New Jersey League of Municipalities, produced reports identifying best practices nationwide, established a peer-to-peer network for communities with CSO systems, and identified new ways of doing business that can improve addressing CSOs and incorporating green infrastructure practices. A professor of Environmental Studies at Stockton University in Galloway Township, Atlantic County, Zimmermann was the lead campus proponent for the school’s Forest Management Plan, which the Pinelands Commission approved in 2013 – making it the first comprehensive forest management plan for public land within the ecologically sensitive Pinelands region. That plan stands as a state model for management of forestland. It uses the latest forest management techniques and best management practices centered on large-scale public use of the land, which is tantamount to having a university in a forest. In addition to serving as a blueprint for how best to use the Stockton forests, Zimmermann’s plan is a working document to transform the forests into a laboratory and demonstration site to develop and implement sound, sustainable forestry practices in the Pinelands region, as well as for other public entities to manage their forestry resources responsibly. By using an interdisciplinary approach to address food insecurity and pollution issues, AeroFarms has taken urban agriculture to new heights with large scale, indoor vertical farming techniques. The company’s combination of in-house designed LED lighting technology and secret growing algorithms in a chemical-free and pest-free environment greatly speeds up crop production to communities and partners in need of nutritious, non-GMO leafy greens. These techniques allow Newark-based AeroFarms to optimize plants for taste, texture, color and nutritional density by using sensors to record data points through every minute of a plant’s growing cycle. As a result, AeroFarms uses significantly less water and fertilizer than traditional agricultural producers, and is not reliant on weather condition for successful production and harvest. In the past four years, AeroFarms has created eight working vertical farms and is developing models to replicate additional farms in communities that lack supermarkets, resulting in job creation, availability of fresh produce, and furthering economic revitalization in communities that need it. This innovative public-private partnership between corporations, federal and state agencies, nongovernmental organizations and academia, works to develop and implement projects to protect and improve New Jersey’s coastlines, freshwater wetlands and aquatic habitats. Since 2005, the partnership has funded 29 projects across the state, which led to the preservation of more than 520 acres and 17 stream miles. Additionally, more than $700,000 in contributions and in-kind services from the initiative’s partners has resulted in projects totaling more than $8.5 million. Projects to date have included habitat restoration, marshlands, fish passages, dam removals, species protection, education and outreach, and cultural and historic projects. Additional projects are under way, the most recent of which aims to restore the resiliency and functionality of a degraded section of the Wallkill River while involving 200 students to help with tree planting and protection along the river in Sparta Township, Sussex County. This particular effort exemplifies the collaborative approach used in all partnership projects. Merck re-engineered the efficiency of its food waste collection program at three of its Central New Jersey campuses after an out-of-state facility that accepted Merck’s food waste closed. As a result of its commitment to reduce operational waste and increase recycling at Merck’s locations in Whitehouse Station, Lebanon and Branchburg, the pharmaceutical giant achieved and surpassed a 2014 corporate recycling goal two years ahead of schedule. Merck accomplished its goals early by developing food waste composting programs, centralizing trash, standardizing containers and labeling at all trash and recycling stations, educating employees about the importance of recycling through signage and internal communications, and implementing measures to keep trash from going to landfills. The result was 1,594 tons of nonhazardous materials recycled, equaling a 48 percent recycling rate; 989 tons sent for waste-to-energy recovery, amounting to a waste diversion rate of 78 percent; and nearly 70 tons of compost diverted from trash, saving the company $334,000. In 2009, Groundwork Elizabeth developed the Come Grow With Us! Community Farm and Garden Initiative to improve access to locally grown produce for urban communities that border Kean University in Union Township, Union County. Since then, the program fills a void in a county that has almost no commercial agriculture, and works because of its ability to build support for locally grown agriculture in an environmentally friendly way, with an aim to improve community health and welfare. As part of its efforts, Groundwork Elizabeth manages the 10-acre Liberty Hall Farm at Kean and builds upon a growing network of partner gardens to fulfill its mission of helping Union County at-risk communities receive healthy, locally grown, nutritious produce in order to combat poor nutritional habits, lack of nutritional education, and target obesity rates. In 2015, more than 3,000 pounds of produce was harvested at Liberty Hall Farm. In 2015-2016, the initiative partnered with 37 community gardens and one farm, provided more than 10,000 seedlings to support the network, and distributed more than 7,500 bottles of donated fertilizer in Union County. When it comes to disseminating information about wastewater treatment, or educating environmental professionals about new technologies in the field and providing continuing education, other states look to New Jersey as the model for this critical field of science. That reputation has been earned through the diligent efforts of the New Jersey Water Environment Association, a 100-year-old collaborative that annually provides thousands of hours of environmental education and thousands of dollars in scholarships to promote the field’s future environmental advocates. New Jersey’s program is known for its diversity of courses of study, quality control, and proper training documentation to meet the rigorous requirements of oversite organizations. In the past year, the association provided approximately 50,000 training hours to the environmental community. Association members routinely volunteer to work with DEP on a variety of policy matters, and offers expertise to groups and programs outside New Jersey. Additionally, the association promotes environmental education at the middle and high school levels, as well as college level, to grow, develop and mentor the next generation of environmental advocates. This environmental STEM (Science, Technology, Engineering and Math) afterschool program has earned recognition in multiple national environmental science competitions during the past year for several projects that developed state-of-the-art solutions to traditional environmental concerns. The program involves 150 students from eight Jersey City schools who are divided into STEM teams to learn more about the city’s water supply, plastics pollution, STEM-based physical activities in nature, threats to bee health in urban environments, storm water runoff pollution and aquaponics gardening. Among the program’s projects so far are converting the school greenhouse into a vertical aquaponics garden, designing a solar pumping system at a local reservoir, and creating a bio filtration system on an island in the reservoir to filter water and prevent algal blooms by using microfiltration. In addition to that work, a team of eighth graders involved with the program has educated other students about microfiber pollution and designed technology to prevent it. Still another team is developing technology to use compost and solar power to trap mosquitos. TCNJ has five Level 2 charging stations in its commuter student parking garage that have been operational for approximately one year, and are used by both commuting faculty and students. The installation resulted from a unique partnership between the Ewing school and PSE&G -- TCNJ committed to using the charging stations for faculty and staff, and PSE&G provided the electric vehicle charging equipment for free. TCNJ paid for the equipment installation and is responsible for ongoing maintenance and electricity costs. A ribbon-cutting event to highlight the partnership and promote the use of Electric Vehicle Charging Stations was held in July 2016. Installation of the stations received widespread media coverage, from the campus newspaper to network television news in Philadelphia. The utility in 2015 installed 30 Level 2 charging stations, bringing to 45 the number of stations installed statewide. The 2015 installation included 10 stations in a Newark parking garage, 10 stations at the company’s Training Center in Edison, and 10 stations at its Central Maintenance Facility in Edison. Solar panels were also installed at the Training Facility, but they do not directly feed the charging stations. PSEG has also implemented an extensive educational campaign to promote use of electric vehicles to employees and customers. There has been a feature story in a company magazine, two write-ups in a company blog about the benefits of electric vehicle use, and promotional material sent to employees about installation of charging stations at a hospital in New Brunswick, Middlesex County.